a large work for its permanent collection on the occasion of the 50th Anniversary of the Holocaust in 1995. 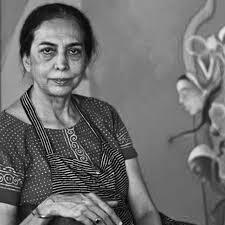 Her paintings are in collections, both public and private, including National Gallery of Modern Art, New Delhi, Mumbai and Bhopal, Ethnographic Museum, Stockholm, Rockefeller Collection, New York,Victoria and Albert Museum, London and in The Asian Art Museum, San Francisco. She lives and works in New Delhi.